At first glance pawn loans and payday loans may seem like similar options, but in reality they are vastly different. Payday loans are loans advertised as short term fixes to temporary financial issues. They are easy money – but at a high cost. The reality is that often, even starting with the best of intentions, borrowers fall into an even deeper financial hole due to the fees and terms connected with these types of loans. Payday lenders are banking on your ability to produce future income. When applying for a payday loan you are asked to reveal and produce proof of employment which must be verified with your employer, the names of three references – which they contact, and while they do not require a credit check – if you happen to default they report regularly to all three credit bureaus which can be incredibly detrimental to your future financial outlook. There is no real privacy in this type of lending and there can be long term consequences if not handled properly. Payday loans take time and require patience while all verifications are done to see if you qualify. Cost: A typical two-week payday loan equates to an annual percentage rate (APR) of almost 400% and can even go as high as 800%. With Payday loans, payments are due every two weeks and interest can compound. This often puts the borrower behind once again and at a place where paying back the full loan isn’t possible creating an ever lingering debt that grows instead of shrinks, absorbing their ability to create a positive cash flow in their life. Defaulted payday loans can stay on your credit report for up to 7 years and additionally can be sold to collection agencies which may or may not attempt to collect for that time and sometimes well after. Pawn Shop Loans are confidential and not based on credit. They do not check or ask for references. They are not contingent on employment. These types of loans are solely based on the current fair market value of whatever asset you are looking to pawn. When you pawn an item, you temporarily hand over ownership for a contracted period of time to the pawn broker in exchange for the agreed upon loan amount and fees. Your merchandise is carefully cataloged and stored. It is fully insured should anything happen to it while in the care of the pawn shop. First Pawn has a standard loan length of 30 days with an additional 30-day maturity for a total of 60 days (2 months). After that, the loan is pro-rated by day. The rate of the loan is 25% monthly which is governed by the state of Florida. The majority of the loans we issue are paid off within an average of 6 to 7 weeks and just over 80% of items pawned are retrieved by the original owner. Pawn shop loans, with stores like First Pawn, which is locally owned and family run, are done in hopes of a mutually beneficial and lasting relationship. We are here to help our customers out when they need it and wish to earn their repeat business. Pawn loans are fast, especially if you are already a current or past customer who is already in the system. You can be in and out in a matter of minutes. 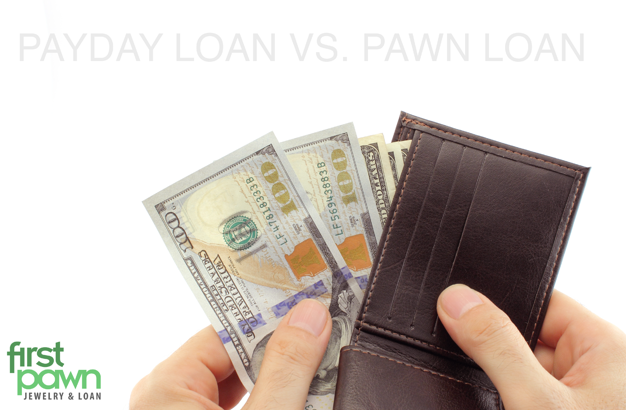 Unlike Payday Loans, pawn loans cannot be reported to the credit bureaus. If you are not able to, or make the choice not to return, pay off and pick up your merchandise, the item is then forfeited to the pawnbroker and in turn the loan is considered paid off and closed. There are no future repercussions.